The National Capital Area Chapter of The Gesneriad Society: planning for the Convention yet? Yes, yes, it's still only March, last frost hasn't passed, and July seems like a long long way away. But it's time to start planning entries for The Gesneriad Society's Convention in Philadelphia. All plants must be grown by the exhibitor and have been in the exhibitor's care for at least 3 months prior to the show. That means the cut off is very early in April. Reservations are required for the artistic and arts entries, as well as commercial and educational entries. Although the deadline is June 20, 2011, space is limited. 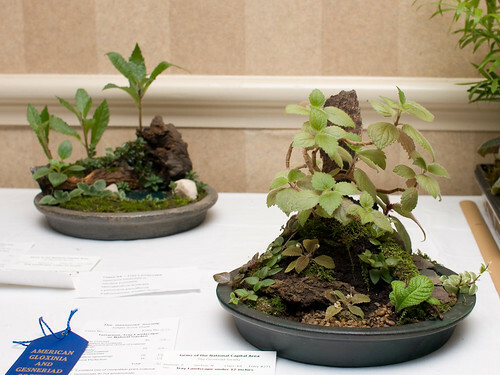 These are the arrangements, terrariums, plantings, photographs, and other arts and crafts representing gesneriads. For details, check out the various PDFs on The Gesneriad Society's Convention page.